• Commentary - in this brand new audio commentary, Bruce Goldstein, director of repertory programming at New York's Film Forum, and Scott McGee, director of program production at Turner Classic Movies, discuss in great detail New York's landscape at the time when Speedy was shot, how the city evolved (or did not) during the years after the film was released, the casting process and important bits from the lives and careers of the principal actors, Harold Lloyd's image (and some of the famous directors that admired his work, such as Yasujiro Ozu and Preston Sturges), the editing of the film (parts of different sequences were shot in completely different locations), some of the advantages of Kodak's Panchromatic film stocks which cinematographer Walter Lundin used, etc. The commentary was recorded exclusively for Criterion in 2015. • In the Footsteps of "Speedy" - in this incredibly informative new documentary, Bruce Goldstein, director of repertory programming at New York's Film Forum and founder of Rialto Pictures, reveals where many of the most memorable sequences from Speedy were shot. (Visual comparisons and detailed analysis are included). The documentary was created exclusively for Criterion in 2015. In English, not subtitled. (32 min, 1080p). • Babe Ruth - in this new featurette, David Filipi, director of film and video at Wexner Center for the Arts at the Ohio State University, discusses Babe Ruth's appearance in Speedy and his popularity after he joined the Yankees, and presents a selection of rare Hearst Metrotone newsreel footage featuring the star from the UCLA Film & Television Archive. In English, not subtitled. (41 min, 1080p). • Narrated Stills: Deleted Scenes - presented here is a collection of deleted scenes with a narration by Bruce Goldstein. (Some production stills are also included). In English, not subtitled. (5 min, 1080p). 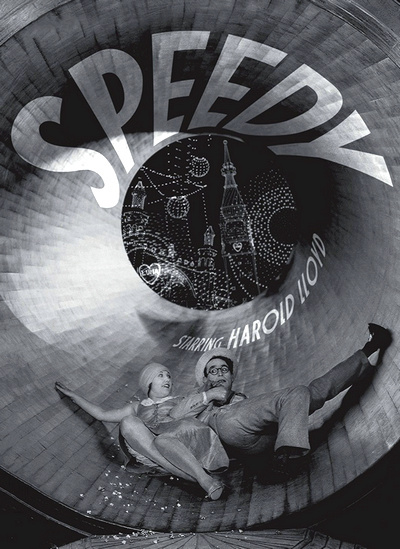 • Home Movies - Harold Lloyd's granddaughter, Suzane Lloyd, narrates a selection of footage shot around the time that Speedy was made. The footage comes from Harold Lloyd's big archive of home movies. In English, not subtitled. (18 min, 1080i). • Bumping Into Broadway - this newly restored short was completed in 1919. It is the only title other than Speedy in Harold Lloyd's filmography that is set in New York City, though it was shot entirely in LA. It is presented with score by Robert Israel which was completed in 2004. (26 min, 1080i).